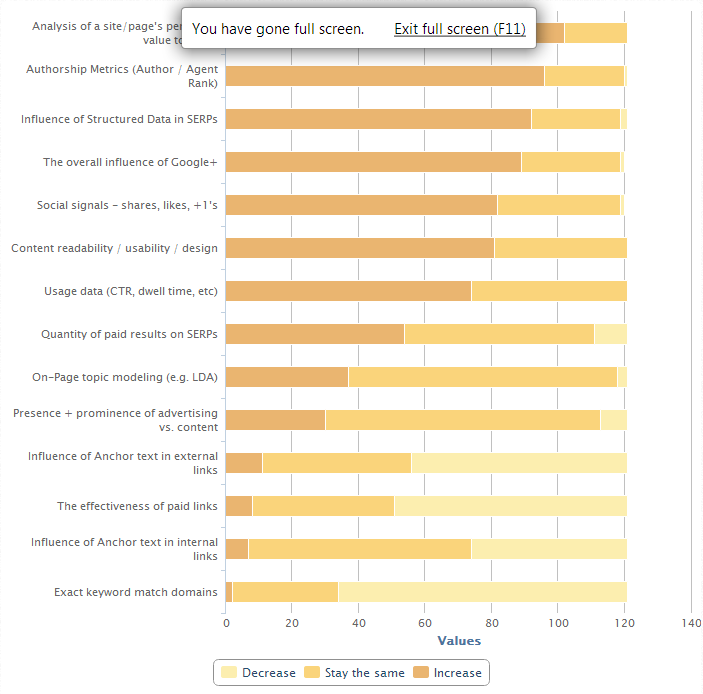 The complete results of Moz.com’s 2013 Search Engine Ranking Factors survey have just been released. Every two years, Moz conducts a survey asking search marketers what they observe as the most important search ranking factors. The full results of the study are consistent with the partial results Moz released earlier, and some of them debunk prevalent misconceptions about getting websites to rank on the SERPs. Page-level link authority features dominate the entire chart – 7 out of the top 10 page ranking factors correlated with high rankings are page-level link authority features. The highest-placing search ranking factor is Page Authority, which, at 0.39, is one of the highest search engine ranking factors tracked by Moz so far. You can compare the page-level link authority features and the domain-level link authority features using the interactive chart. Page-level link metrics rank higher in terms of correlation to better SERPs rankings than domain-level link metrics. The survey also debunks one of the most important general beliefs today: that social is becoming the major player in ranking websites on the SERPs. Those who have been ignoring link building in favor of social media marketing will be surprised to know that the two are almost equally correlated to higher rankings. Beefing up your social media marketing may not yield as desirable results as if you beef up your link building and social media strategies together. Page-level anchor texts continue gaining strength as a search ranking factor, with partial anchor text matches getting correlation scores as high as 0.29. While non-keyword usage and non-link metrics features do not figure as much in the survey, an interesting negative correlation is revealed: page response time and URL length in characters have the highest negative ranking correlation. Both items are at -0.10. On-page keyword usage is becoming less correlated to ranking high on the SERPs. It has continued to decline since the last full search ranking factor results were released two years ago. The table below shows the summary of Moz’s findings for this year. 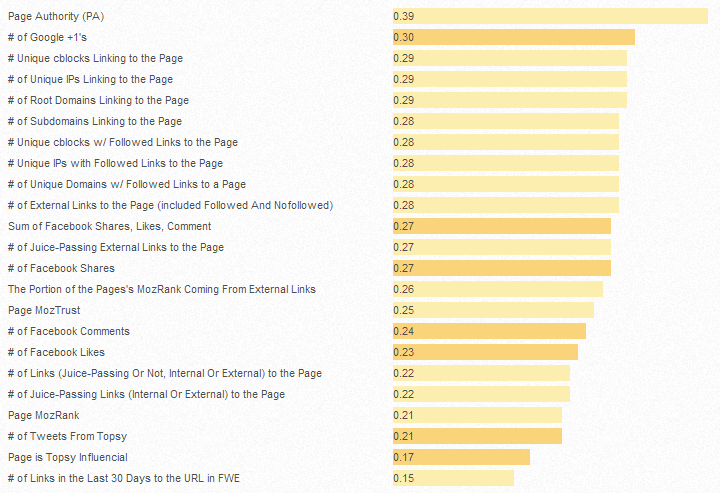 As you can see, domain-level link authority features still show the highest correlation to good rankings. 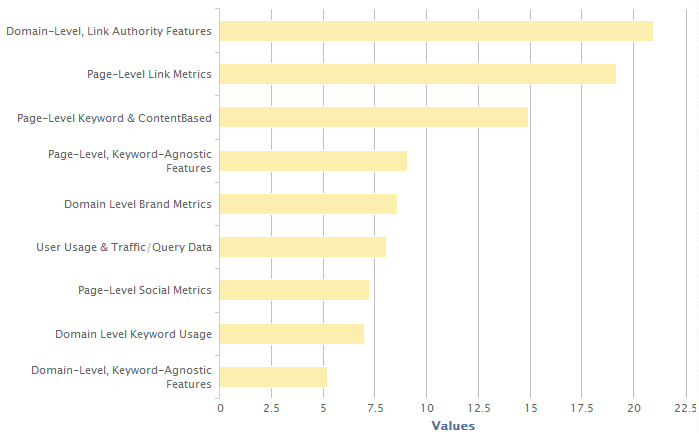 Page-level link metrics and page-level keyword usage follow in second and third places, respectively. The predictions of survey participants are consistent with the results of the survey. They see search engines moving towards looking at relevancy and quality more than technical things like exact keyword match domains and anchor texts. It’s important to focus on the factors that increase the perceived value of your clients’ website to your target market and factors that help Google discover the context of your content now and in the days ahead. Check out the other predictions below. We’re happy to let our partners know that we’ve anticipated the direction search is taking and have prepared your campaigns in line with these ranking factors ahead of time. Talk to your account manager today to get an update on your status. If you’re not yet our partner, sign up now to gain access to our robust SEO solutions. Keep checking back for more news and tips! Ready to grow your agency? Us Too! Subscribe to our weekly newsletter and easily manage your client's local presence in weeks. Clayton is the Marketing Director of SEOReseller.com and managing partner of numerous successful online brands offering white label SEO and other online marketing services. We are a premier provider of digital marketing solutions to agencies worldwide. With heavy investment on research and development, our digital marketing technology is cutting-edge and our methodology is effective. Through our agency partners, we serve businesses from small brick and mortar stores, national retail companies, to Fortune 500 multinational corporations.